In Eddie Stobart livery of white over dark green. Dark green plastic base, grille, bumpers and interior. 'glazed' headlights, amber indicators, red rear lights. 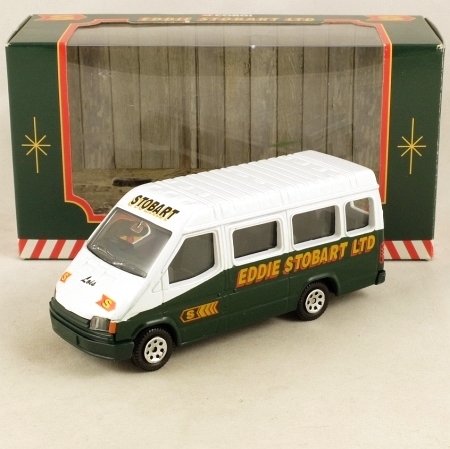 'Eddie Stobart Ltd' and logo on the sides and rear in gold and red, 'Stobart' on the front of the roof. Logos and the name 'Lois' on the bonnet. 'Personnel Carrier' in white on the opening rear doors. Black wheels with silver 7-hole centres and suspension. This one is in mint condition and in a very near mint Eddie Stobart window box.